In 2002, Alzheimer's disease caused 58,289 deaths in people age 65 and older - 99% of all Alzeimer's deaths that year. 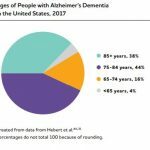 Silver BookIn 2002, Alzheimer’s disease caused 58,289 deaths in people age 65 and older – 99% of all Alzeimer’s deaths that year. In 2002, Alzheimer’s disease caused 58,289 deaths in people age 65 and older – 99% of all Alzeimer’s deaths that year.